Whether you have downloaded the program yourself, or it was installed without your notice, WinSecurity is not the application we recommend running on the operating system. Even though on winsecurity.net it is promised that the program will enhance the performance of your browsers (IE, Chrome or Firefox), make the web surfing more secure and protect you against phishing attacks, the application could be the cause of different virtual security risks. 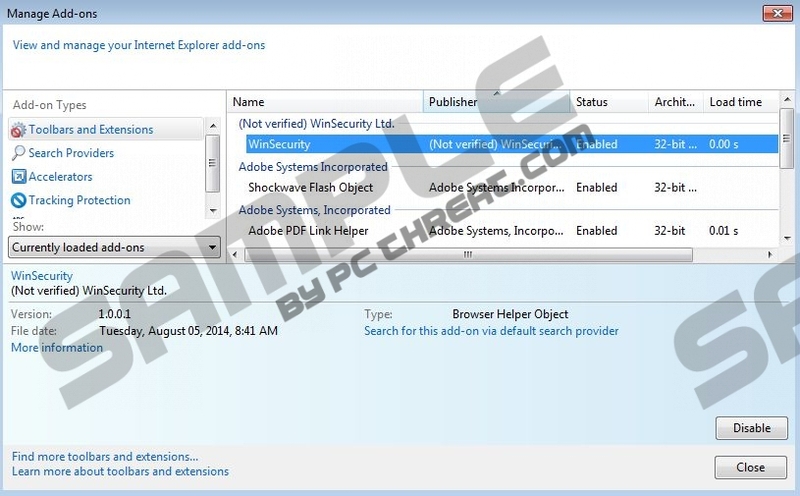 WinSecurity removal is recommended because this extension is an ad-supported application, or adware, and it has been designed to present online offers. Tens and hundreds of advertisement-supported application are created every day. Some of them are more devious than others, and some of them should be deleted without further delay. Luckily, WinSecurity is not the most devious or clandestine threat you could face; however, you still should remove it because the ads associated to it may be unreliable and even misguiding. When you discover ads ‘brought by WinSecurity’, instead of clicking on them, you should remove adware ASAP. It has been revealed that WinSecurity begins flooding the browsers with ads about 12 hours after installation, and this is why not all computer users immediately link the presented offers with the allegedly trustworthy security program. This struggle is shared with the users of WebEnhance, WebCheck, WinGuard, and other clone programs which, needless to say, require removal as well. Luckily, since these programs act in the same way as WinSecurity, you can delete them using the same removal instructions. WinSecurity can be installed by third-party software distributors (e.g., Amonetize). It is risky to trust third parties because they usually bundle multiple installers, and this may lead to the installation of various ad-supported programs and PUPs that you will need to delete. OffersWizard, DolphinDeals, GenesisOffers, Surf Safely and FabulousDiscounts are just few of the many applications which you may discover running on the PC. If you do not remove these in time, even more disturbing ads may show up. We urge you to delete WinSecurity ASAP because even though this program is meant to help you browse the Internet more securely, it is more likely to endanger your virtual security instead. Keep in mind that when you uninstall the program (removal instructions below), certain files may require further attention. What is more, the removal of additionally installed programs may be even more challenging. Due to this, we suggest that you choose automatic malware removal software instead of dealing with the suspicious software by yourself. Move to the left of the Task Bar and click the Start button to access the user menu. Select Control Panel and a menu listing different Windows utilities will show up. Double-click Add or Remove Programs and in the menu select Change or Remove Programs. Select the undesirable application and then click the provided Remove button. Navigate to the left of the Task Bar at the bottom of the screen and click the Windows icon. In the appeared Start menu select Control Panel and click Uninstall a program. Right-click the program you have chosen to delete from the PC and then select Uninstall. Tap the Windows key on the keyboard to access the Metro UI menu and right-click on the screen. Select All apps to open the Apps menu, then click Control Panel and go to Uninstall a program. Finally right-click the application you wish to delete from the PC and select Uninstall. Quick & tested solution for WinSecurity removal.